Hey everyone, there was quite a bit of info just announced at Paris Games Week. First, Street Fighter V has a confirmed release date of February 16th, 2016 in North America! So mark your calendars as we count down the days towards launch. Also, we have just announced that we’re releasing six additional characters post-launch in 2016. As mentioned previously, all post-launch gameplay related content will be earnable with Fight Money, and we have revealed the first details on how players will be able to earn Fight Money when the game comes out. And last but not least, we have confirmed that Dhalsim will be joining the initial roster as the first true zoning character in the game. In case you haven’t heard, Street Fighter V is moving away from doing large bundles of post launch content, such as our prior Super or Ultra upgrades, and instead will be continuously releasing new post-launch content on a regular basis. No longer will you need to wait one or two years for new Street Fighter goodness; it will always be right around the corner. We have confirmed that we will be releasing 6 new characters post-launch in 2016, which will bring the total roster up to 22 characters by the beginning of 2017. On average, we will release one new character every two months, provided everything stays on track with our development schedule. More specifics will be shared when our post-launch plans are confirmed. Now, the next question you probably have is… how hard is it to get these characters for free? The purpose of the Fight Money system is to reward players who stay engaged with Street Fighter V over time. While we are still finalizing details on pricing and Fight Money accumulation rates, which will be refined throughout our future beta tests, we are excited to share some details on how we are approaching the new system. There will be two primary methods for players to gain Fight Money: completing daily goals, and leveling up individual characters. Each day a player logs into the Street Fighter V client, they will be assigned a new daily goal. Daily goals should be easily achievable in in one play session, and will award Fight Money based on their difficulty. Daily goals will help players improve with a variety of characters. It will also ensure that players with a limited amount of time to play per day can still earn characters for free. We want a system that rewards frequency of play, rather than requiring long marathon grinding sessions. Another goal that we have for the Fight Money system is to ensure that players can still earn Fight Money through both single-player and multiplayer modes. We accomplish this by allowing players to earn Fight Money by leveling up individual characters in a variety of modes. To remove any confusion up front, leveling up a character in Street Fighter V will not affect game balance. It only shows how much time and effort an individual has placed into learning a character. Each time a player levels up a character, they will receive a Fight Money bonus. Earlier levels will be easy to obtain, and will scale to become more difficult the higher the level. Street Fighter V will reward players who experiment with a wide variety of characters, and those who play frequently. If you complete your daily goals and level up your characters on a regular basis, you’ll be on your way to earning new characters with ease! For those who just can’t wait to earn each piece of new content, content can also be purchased instantly using our premium currency, named Zenny, which can be bought with real money. Here Comes a New Challenger: Dhalsim! The return of Dhalsim in Street Fighter V marks the addition of the first true zoning character to join the initial roster. Using his long-range limbs and slow projectiles to frustrate overly offensive opponents, Dhalsim’s style has historically been keep-away since his inception in Street Fighter II. 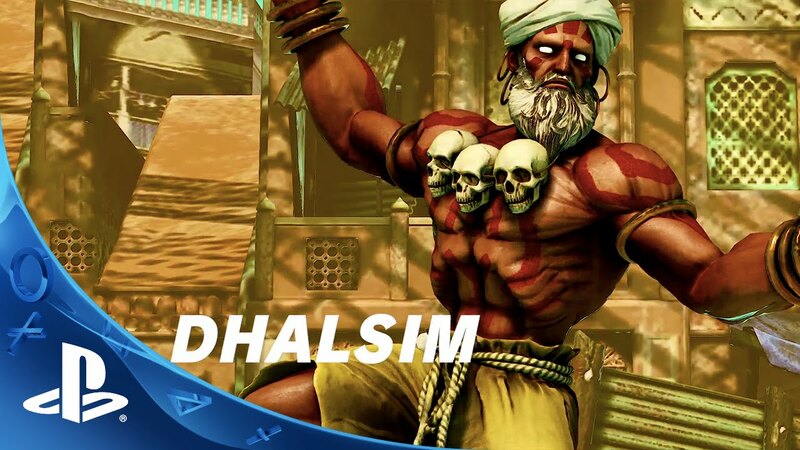 Although he’s a pacifist, Dhalsim steps into battle when it comes to saving others. 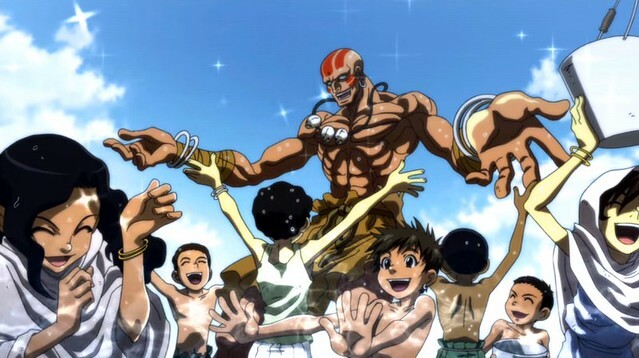 From raising money for the poor to destroying dams that are forcefully keeping water from his village, Dhalsim takes up arms if the good outweighs the harm he can cause. 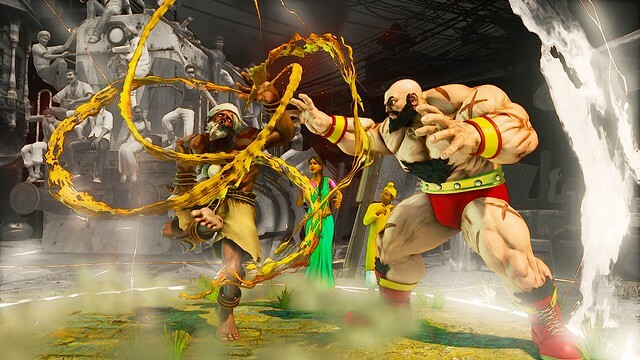 In Street Fighter V, Dhalsim once again joins the fray to help those in need. Not one to slack on his Yoga training, Dhalsim has mastered a few new Yoga skills for this upcoming battle, those being his V-Skill — Yoga Float and his V-Trigger — Yoga Burner. 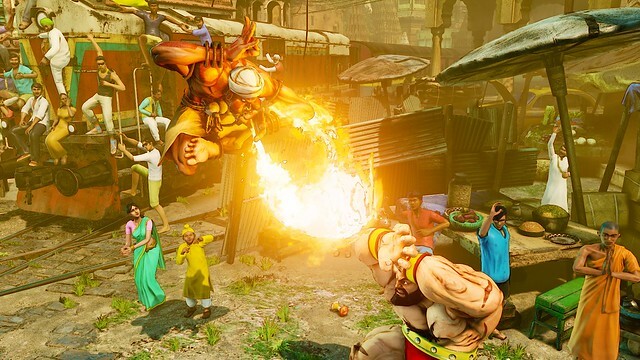 Upon activation Dhalsim hops into the air and floats for a few seconds. During this time, all airborne attacks and specials are accessible. This can also be activated in the air. Dhalsim shoots out a stream of flames that stays on the screen on the floor for an extended period of time. If the opponent stands in the flames, they will slowly lose life in the form of recoverable damage. Once they step out of the flames, their life will begin to recover. 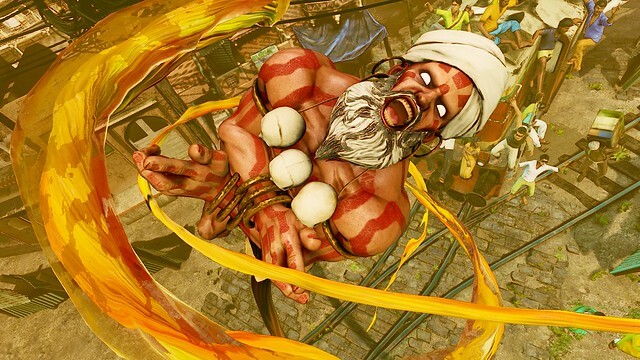 Will Dhalsim’s style be strictly keep-away or will he be more aggressive this time? Fans at Paris Games Week will be experience him for the first time on the show floor, so people will find out soon enough! Dhalsim’s attacks look insane! I am very impressed. 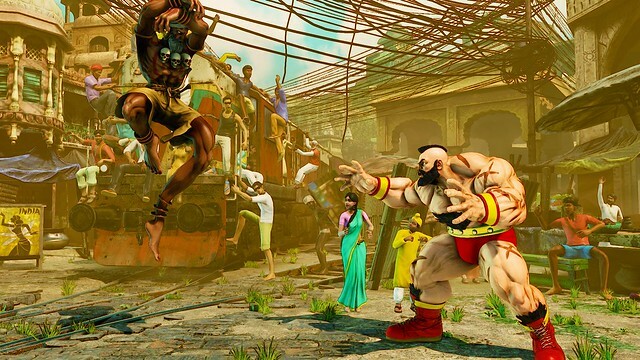 Dhalsim looks absolutely incredible and I never like him before. It’s a shame that a lot of other characters aren’t showing age or new designs. I’m really liking the new looks for Sim, Bison (Dictator), Vega, Ken, Birdie, Nash. I would have loved to see characters like Ryu, Chun-Li, Cammy, Zangief and more have updated looks. I mean if we are progressing the story (timeline) why do those characters look identical to their previous iterations? Completely closed my eyes when Steet Fighter 5 was on stage. We need the time machine from Steins;Gate to go back to Feb 16th, 2015 to play this. I was expecting march, so I’m really happy it’s coming earlier. Day one! are there any GLBT characters? There IS a transsexual character actually, Poison. She’s in SFxT and USF4 . I don’t think Capcom ever confirmed it for a SF character. If I remember correctly the rumors of Poison being a transexual have been shot down by Capcom themselves. I believe Vega is gay, though I could be going only by stereotypes. I also think Zangief could be gay due to his also stereotypical ‘bear’ appearance (hairy, muscular, and proud of it) and how he never showed a wife or kids (like Ken did). Abel is a possibility too – his intros and endings show rainbows and being super friends with Chun-Li – nothing wrong with friending a girl, but gay guys usually friend girls and it’s the whole package that adds to it. Juri may be lesbian/bi, as she mocks/teases both Chun-Li and Cammy in suggesting ways. Anyway, just speculation. No one is officially gay/lesbian/bi officially in the SF lore as far as I know. All those ‘hints’ could also be just Capcom’s way to tease people and spark discussion. Capcom Ono: Oh ho ho ho ho boy! We’re back on PlayStation, finally! Don’t have to deal with Microsoft-san. Sony: Uh, yeah. Right. We’re not too thrilled we’re funding this because you’re having financial problems that it’ll be on PC, because not to many gamers game on a Vaio but, hey. Whatever. Sony: Whoa! Whoa, whoa, whoa! STOP! No, We’re gonna stop this bleeding before it get’s any worse. We’re not Microsoft. They started DLC which lead to Microtransactions. NO! We’re for the player, not for, no! We’re fixing this. Everything that can be obtained, will purchased in-game. We’re going back to the olden days when gaming was fun. We’re trying to WIN here with the PS4. Remember the days when you unlocked everything that was stored on a cartridge first, and then a disc? Capcom: Yeah, what’s your point Sony-san? Sony: That’s what we’re saying. Everything will be stored on disc and accessible by unlocking it in game. You see Capcom, we’re right back where we needed to be with the PS4. We hit a homerun with the PSX, and the PS2 was a gamechanger putting NIntendo back in their place. Capcom, we want to sell games and hardware, not pinch for pennies. Give it ALL to them at a reasonable price and we’ll make more and you’ll regain that fame you once had. The masses don’t want microtransactions. They want a fair deal. We’ve reclaimed our seat and we’ll be damned if we should lose it. No. We’re giving it to the gamers. We want to sell hardware and you want to sell games. This is the best way to do it. Trust us. Capcom: Hm… Alright! Game on! Dhalsim eh?…you guys better announce Juri as one of the 16 characters.Also looks like you guys are taking the right approach with Fight Money but we’ll see about that.And I never get tired of saying this…man this game is looking gorgeous. That DLC model sounds fair/acceptable. HEY CAPCOM! THANKS FOR MAKING THIS DEAL WITH SONY! Now my question is…. where DA @#$% #$%Z^$ is DEEP DOWN! ?